We are Manufacturer, Supplier & Exporter of Rotary Airlocks and our setup is situated in Miraj, Sangli, Maharashtra, India. Khare Rotary air locks are designed by a team of engineers with considerable experience in design, application and after sales service to give customer confidence. 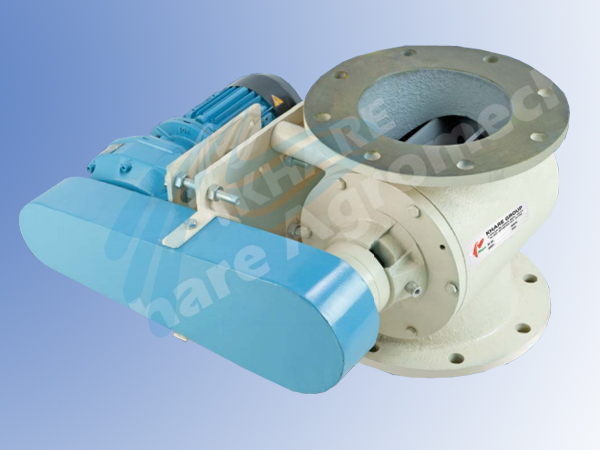 Khare Rotary air locks are manufactured on highly precision machines like CNC and VMC machines, to maintain minimum clearance between body and rotor. The clearance is maintained as close as 0.1mm. 1. Feeder applications with no pressure used purely to feed product from a bin or hopper. 3. Pneumatic conveying applications where feeding material into a system against pressure or vacuum. 1. Heavy duty casting (Cast Iron) for body and end covers. 2. Good throat opening at valve entry allowing high pocket filling efficiency. 3. Rotor (Fabricated EN8 steel) robustly constructed to minimize the deflection. 4. Minimum clearance between rotor tip and body. 5. End covers doweled with body to achieve best concentricity. 6. Out board bearings (Sealed for fife ball type) for non contamination. 7. Precision machining of components on CNC and VMC machines. 9. Drive-TEFC geared motor unit mounted on valve body complete with sprocket and chain drive all enclosed in guard.